Managers and executives in group living environments - from university housing to group homes - agree that the one of biggest challenges they have is buying furniture that is tougher than their clients.So when you have a tough crowd how do you choose furniture that is tougher? Here are six tips from savvy buyers who have been there and done that! Heavy Weights are Still Champion. 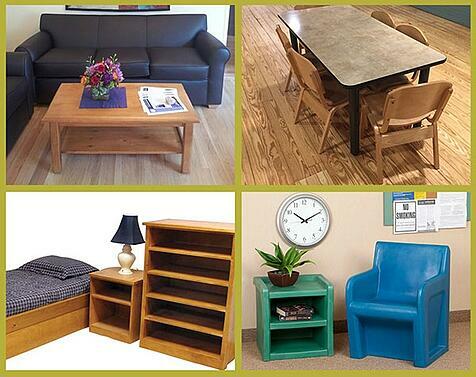 When it comes to highly durable furniture for any area frequently used area of your facility, solid wood frames are still victorious versus retail-grade upholstered furniture. Solid wood frames with replaceable cushions will not weaken over time. This style of furniture shows what it is made of on the outside. The frame is totally visible so you know exactly the quality of what you are buying. When seating furniture is covered by fabric and foam it is pretty hard to tell exactly what is “under the hood.” The durable, well-crafted exposed wood frames let you get up close and personal with the quality of the components, the joints, the finish, etc. There is real peace of mind in knowing exactly what you are buying. Comfy Needs Construction Confirmation. If fully upholstered is your facility’s style it is crucial to verify what is on the inside of any furniture purchase you are considering. Like any other durable good, not all things are created equally – especially when the nuts and bolts and internal construction cannot be seen. The only indication you will have of the quality of the inside is its ability to wear well over time. A weakening frame cannot be saved so a good-looking, good-priced seating piece might not be a good investment if it has to be replaced quickly. The joinery, lumber density, wood species, foam density, and the quality of the fabric is the difference between a one-year replacement cycle and a four-year replacement cycle. One-Piece Molded is Impact Proof. One-piece molded, rotationally molded is constructed of polyethylene (sometime referred to as molded plastic) is impact-resistant and will not break, puncture, or crack over time. Made in fun, bold colors these sassy seats can be ganged, bolted to the floor, weighted with sand, or left on their own. Arm chairs, side chairs, roomy lounge chairs, and seating cubes can be tossed and mistreated and still hold up strong. Metal Can Be a Miracle. Steel beds, bunks, dressers, chests, and cabinets can be finished in your choice of painted finishes and laminate enhancements. Recycled railroad ties are a primary source of metal for these tough bedroom pieces so you know they are industrial-tough, heavy gauge steel. Metal furniture can offer extreme durability, custom configurations, custom finishes, and extensive warranties. Some metal furniture is warranted against manufacturing defects for up to 25 years. Now that is some peace of mind! Best of Both Worlds. When you want tremendous durability and great style, consider furniture that combines two or more of the hardest working materials. Metal frame occasional, dining, and task seating can be combined with wood, plastic, or upholstered seats and backs resulting in a high-design, highly durable seating. Metal frame seating can also be a great tool to provide comfort and safety for larger clients and staff. Many manufacturers will weight test their furniture to let you know up front how much weight each of their models can accommodate. If you know that you need to provide seating that supports heavier weights it is crucial that you know that your chairs can safely hold up. Mattress Materials Matter. Mattresses have to offer enough comfort to allow healthy sleep while holding up to the pressures of heavy use and fluids spills. There are a wide variety of material core types available from innerspring to fiber to foam and each core has a large number of quality variations. Of all the furniture purchases facility managers and professional buyers make, mattresses tend to be the trickiest; many buyers report having had at least one bad buy resulting in unraveling seams and sagging foam. Not only are there a wide variety of cores, there are also a wide variety of covers - some fluid-proof; some fluid-resistant; some like sponges that will show the slightest spill or stain. Additionally, the type of seam and the type of thread all matters when it comes to mattresses. When you are buying furniture for any group living environment, always choose to work with a professional wholesale reseller who has experience in your industry. The lowest priced option is typically priced related to poor quality. The highest priced option may well be overpriced due to low volume sales that might equate to an overall lack of industry experience. The best value is always the provider who can explain materials, quality, and offers solid advice based on real world experience.